from original materials supplied with the permission of Middle-earth Enterprises. 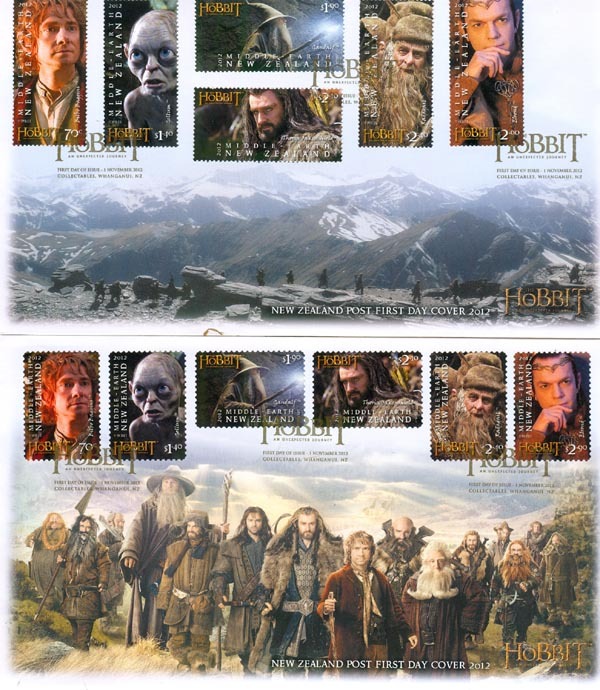 On this date, six stamps were issued, commemorating the New Zealand production of 'The Hobbit: An Unexpected Journey' scheduled to premier on 28 November 2012. These six stamp designs were offered in gummed and self adhesive forms, as well as booklets, FDCs, miniature sheets, maximum cards and Presentation Pack. Unless stocks are exhausted earlier, these items will remain on sale until 31 October 2013. After that date, another set of stamps will be issued commemorating 'The Hobbit: The Desolation of Smaug'. For further information regarding these items, go to the The Hobbit: An Unexpected Journey NZPost Site. 70c - Bilbo Baggins - Like all Hobbits, Bilbo baggins is fond of his comfortable existence; all he need to be happy is a full pantry and a good book. when the Wizard Gandalf and 13 Dwarves unexpectedly appear on Bilbo's doorstep and invite him to join them on a dangerous adventure, Bilbo's life changes forever. $1.40 - Gollum - Once a hobbit-like creature named smeago, Gollum's body and soul have been poisoned by the power of a small, plain, gold ring that he has kept hidden deep in a dark cavern within the Misty Mountains. Unaware of the true nature of this Ring, Gollum knows only that it is more "precious" to him than life itself. $1.90 - Gandalf - Once of the most powerful Wizards in all Middle-earth, Gandalf the Grey joins the quest to reclaim the Dwarf Kingdom of Erebor and the great treasure that lies within its stone halls from a fire-breathing dragon, Smaug the Terrible. $2.10 - Thorin Oakenshield - Thorin witnessed the destruction and terror wrought when a great fire-breathing dragon attacked the Dwarf Kingdom of Erebor. As the strong, fearless fighter and respected leader of The Company of Dwarves, Thorin is determined to reclaim his homeland and destroy the beast that brought such misery upon his people. $2.40 - Radagast - Forgetful, easily distracted and quite eccentric, Radagast is more comfortable talking to animals than he is to people. A fellow Wizard and friend of Gandalf the Grey, Radagast is one of the guardians of the great forest of Middle-earth. $2.90 - Elrond - One of the wisest and most ancient of the Elves remaining in Middle-earth, Elrond is Master of Rivendell, the Last Homely House East of the Sea. Though leery of their quest to reclaim the Dwarves' stolen treasure, Elrond reveals the secret information Gandalf and Thorin need to make it to The Lonely Mountain.